The Source is a regular newsletter which contains a main feature article on a key HR issue along with news, case studies and information from ResourceBank. 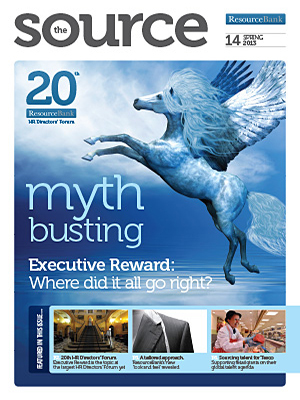 Issue 14 covers reportage of the annual ResourceBank HR Forum, this year on the subject of “Executive Reward: Where did it go right?” Main speaker Deborah Rees from Innecto Reward Consulting was joined by ResourceBank Director Melody Hermon and Reward experts Kevin Ringrose and Jonathan Davies to discuss incentive and reward strategies. The issue also features an article on the evolution of the ResourceBank brand as well as news and case studies on Vector Aerospace, Tesco, Northgate, Aliaxis and Magnet.